Rhizome | Blog Posts tagged "Superlative TV"
Morgan Quaintance | Tue Sep 4th, 2012 9:02 a.m.
As part of England’s nationwide switchover from analog to digital tele-broadcasting, London’s official analog signal went down on April 18, 2012. While dumpsters citywide filled with old TV sets, a flurry of commemorative activity sprung up in the art world. Most notably London’s Institute of Contemporary Arts (ICA) staged Remote Control, a large survey show examining prominent artists’ responses to television; and across town pioneering British video artist David Hall staged 1001 TV Sets (End Piece), 1972 – 2012, an epic installation in which 1001 sets, tuned to one of five UK analog channels, gradually transitioned from color broadcasts to snow and noise. 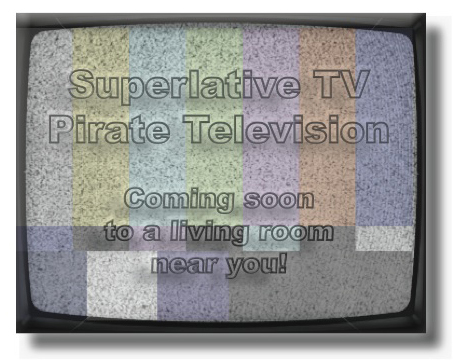 Against this backdrop of retrospection and nostalgia the politicised London-based pirate television group Superlative TV formed. Set to begin broadcasting the evening of September 14, Superlative TV will be available to anyone in the city who can unplug a TV digital receiver and tune into the yet to be designated frequency. Inclusive, liberal, and egalitarian, the channel will run a program consisting of community led documentaries, artists’ works, performance, news, and film. Tackling subjects like the 2011 London riots – civil unrest that saw unprecedented looting, arson, and violence in the city – Superlative TV are distancing themselves from the post-modern tendencies of contemporaries like South London’s Auto Italia South East and Lucky PDF. In other words, it is not all about VHS generation loss and ironic distance. Instead Superlative TV seek to offer a politically active model of public access television: an enfranchising, free television service in dialogue with its users, as opposed to a paid for service that is not. Recently I spoke with Superlative TV co-founder Anne Tennor about the upcoming broadcast. How did Superlative TV start and why? I think it started because we saw a need. Not that there isn’t a lot of “art TV” out there, because there is a lot, but art TV seems to have almost become about a brand. A brand in which an individual’s voice might get lost in the crowd. So what we're facilitating is a kind of open platform that is missing from British broadcasting in general, and the idea is to fill the gap of open access television as well as produce art TV. We have a background working with lots of artists in London, doing various projects with moving image and broadcasting whether that is radio or television. Then the digital switchover happened and it just seemed like the perfect time to subvert an old medium that people aren’t using anymore. We see it as a redundant space that can be completely free, completely uncensored, completely unrestricted. Not even the Internet can provide that opportunity, for artists especially. But if you look at last summer’s riots the government was trying to shut Twitter down. So we’re still being controlled, in spite of the idea that we use modern technology to have a voice. It’s interesting that you’re talking about issues of control; because what you are doing you have to do covertly as it’s illegal. We’re hoping through our activity we’ll eventually not be seen as criminals, but as people offering something which should be made legal. Eventually the idea is to have an open access television station in the UK as there isn’t one, but it’s happening all over the world now, of course in America, but also in parts of Eastern Europe you’ve got artists who are offered half an hour on a local channel. That said, open access isn’t the extent of what we plan to program. We’d like to commission relevant programs that national TV doesn’t seem to cover. Also, given the current political situation in the UK, there’s a feeling that some parts of society are being targeted by Conservative policies and not being given a voice at all. So this goes beyond just offering young artists, or people with nowhere to show work, a space. I was thinking about the fact that it’s on analogue television, which means people will have to detune their sets to watch. First of all you’re getting an active and engaged audience, because their making a big effort to find out what we’re broadcasting; and second it’s like time travelling, which is how it feels in the UK at the moment. I just think that a lot of what’s happening has happened twenty, thirty years ago with Margaret Thatcher, and even before that. Things seem to go in cycles and it would be nice to offer some hope. So can you tell me a bit about where you’re at with the project at the moment? Well you’ve come towards the end of phase two. Phase one has been collecting content, practising camerawork, assembling equipment, and we’re ready to go live. We’ve been trying to collect shows together, and ideas for formats. We have a show that we’re advertising now, which is called Prime Time: we’re asking artists and curators to submit three videos to us, one that they’ve made, one they have influenced and one that has influenced them. We’ll screen those after we’ve launched piratically on the 14September.